She started her business, Sigrid Dabelstein Photography, last fall, and her calendar was quickly booked. Sigrid Dabelstein's work includes family portraits, many in beautiful outdoor settings. Woodbury’s Sigrid Dabelstein, a full-time sixth grade math teacher, is also a part-time photographer, who’s carving a niche taking photos of families—always inspired by her own family memories and her knack for capturing images of children. She moved to Woodbury from Minneapolis for the first time with her family in 1995; after the past ten years spent in Minneapolis, she and her husband moved back to Woodbury about a year ago. She’s been continuing to build up her business here ever since. Dabelstein says she’s always associated photography with her father and the camera he carried to capture her family’s most important memories. After he passed away in 2014, she took it upon herself to organize all of the pictures he took throughout the years. “There was something so comforting having thousands of photos to sift through and know that the photographs preserved such sacred memories,” Dabelstein says. Organizing the photos and being able to look back on all of the memories sparked a desire to create these types of photos for other families to share, she says. So, on their wedding day, Dabelstein’s husband bought her her first serious camera, and she began to explore her interest in photography. “He knew of this passion I had for photography, and ever since, I haven't been able to put my camera down,” Dabelstein says. In order to learn some basics, Dabelstein took a class with the owner of Midwest Imagery, Kent Johnson. She started her business, Sigrid Dabelstein Photography, last fall, and her calendar was quickly booked, especially with families seeking photo shoots around the holidays. 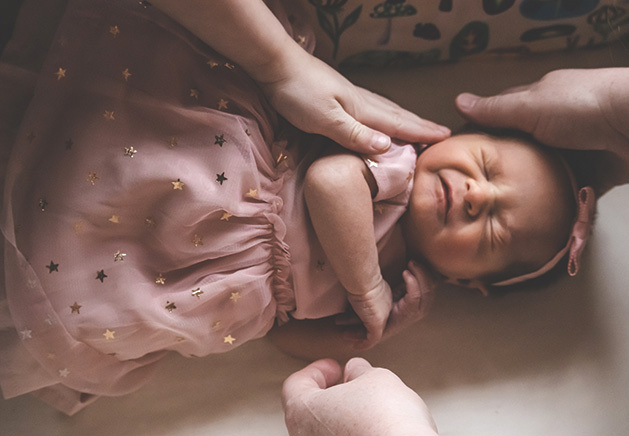 Although her specialization is family portraits, Dabelstein also offers newborn and senior portraits, as well as small-venue, wedding and other celebration pictures. Many of her shoots are outdoors, so she is continuously scouting new locations that can serve as inspiration and backdrop. Some of her tried-and-true favorite spots are Wilmes Lake and Tamarack Nature Center, but sometimes she stumbles upon a space so special she can’t help but add it to her list; a recently discovered favorite is the south entrance to Battle Creek Park in St. Paul. “The night I took family photos there felt magical, as the scenery was just stunning with a calm creek flowing by and the sun just glistening within the trees,” Dabelstein says. Since she’s a teacher in her “day job,” working with children comes naturally to Dabelstein. Being able to bring out the best in them and make them smile and laugh gives Dabelstein the utmost satisfaction. She spends time bonding with kiddos before each shoot and making sure they feel comfortable being themselves in front of her and the camera. She fondly remembers a time when she had to reenact a scene from Frozen and sing “Do You Want to Build a Snowman?” for a little girl who objected to the chilly temperatures. “I know it's the educator in me that is able to build a fast bond with young children. Just like in my classroom with my students, I do what I can to get my families to smile, no matter what it takes,” Dabelstein says.